A 15-year-old boy who attended Timber Creek High School was killed in a hit-and-run accident that occurred in east Orange County, Florida. The driver that hit him fled the scene of the crash, but was eventually apprehended by Florida police. Reports indicate that the young boy was in the street near Avalon Park Boulevard and Pellicer Drive when a motorcycle hit him, according to the Orlando Sentinel. The boy was reportedly playing with several other young people in the road when the collision occurred. This is a heartbreaking incident. Losing a loved one is always difficult, but losing a child is especially gut-wrenching since they had their whole lives ahead of them, but in the blink of an eye, that was taken away. According to Florida Statutes section 316.062, leaving the scene of an accident (also known as a hit and run) is defined as the failure of a driver to remain at the site of an automobile accident and to fulfill other statutory duties, when the accident at issue involves death, bodily injury, or property damage. The “other statutory duties” entail a driver rendering, to any injured person, “reasonable assistance.” This may include transporting the injured person to a hospital for medical treatment or making arrangements for such transportation (e.g., calling an ambulance). Fleeing the scene of an accident is not just against the law, it is also morally abhorrent. A fleeing driver is consciously deciding to ignore the welfare of the victim in the hopes of avoiding a potential traffic infraction. The motorcyclist in the accident described above is now looking at a potential felony conviction in criminal court, in addition to a possible wrongful death lawsuit in civil court. No amount of money will be able to bring a deceased victim back. Nevertheless, a wrongful death claim is a way to hold the at-fault party accountable for their reckless and irresponsible behavior. Mental anguish and emotional pain and suffering from the loss of a child. 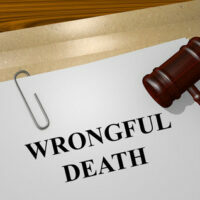 In wrongful death cases involving the untimely death of an adult, there may also be recoverable damages for the loss of the decedent’s income and familial support. A wrongful death case involving a minor generally does not include such damages since the minor was attending school full-time. Nevertheless, the emotional impact and trauma of losing a child is so severe that significant pain and suffering damages may be awarded to the parents and/or other relatives of the deceased minor. One of the most emotionally-draining and overwhelming events of a person’s life is to suddenly lose a child. It is especially infuriating to think that, if not for the at-fault driver’s reckless actions, your loved one may still be alive. That is why you should contact Alan Goldfarb, P.A. today in Miami. We are ready to help you through this tough time and will work tirelessly to hold the at-fault driver accountable.